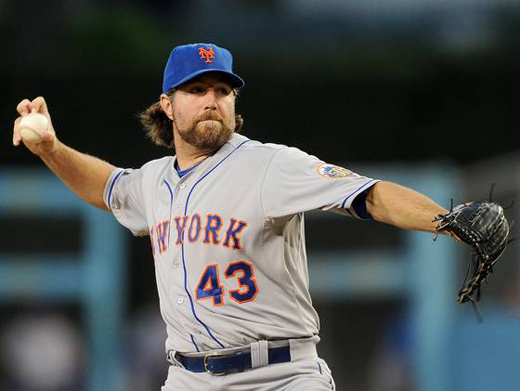 NEW YORK -- In the opening lines of his autobiography, R.A. Dickey writes, "I will never be a Hall of Famer and will never lead the league in strikeouts," unaware that he would indeed achieve the latter feat in 2012. Dickey recalls editing that passage with his co-author, Wayne Coffey, who asked why he did not include "winning the Cy Young" on the short list of accomplishments he supposedly would not achieve. "Because I hoped to," Dickey replied. "I hoped to win the Cy Young." Now he has. The Baseball Writers' Association of America on Wednesday named Dickey the 2012 National League Cy Young Award winner, lifting him over finalists Clayton Kershaw of the Dodgers and Gio Gonzalez of the Nationals. Dickey, who shares his agent and hometown with American League winner David Price, is the first knuckleballer to win the award. "This is a story that's beyond me," he said. "It transcends R.A. Dickey. It's bigger than that." Dickey ran away with what appeared to be a tight Cy Young race, scoring 27 out of a possible 32 first-place votes and finishing with 209 points, more than twice as many as the runner-up, Kershaw. En route to becoming the Mets' first 20-game winner in more than two decades, Dickey led the Senior Circuit in strikeouts, innings, complete games and shutouts, and ranked second in wins and ERA. Through it all, he expanded the legend that began when he joined the Mets early in 2010 as an apparent Minor League burnout. He became a best-selling author in 2012, writing an autobiography that chronicled his slog through the Minors and his history as a victim of sexual abuse. He climbed Mount Kilimanjaro for charity. He starred in a documentary. And he pitched, arguably better than any knuckleballer in history. Often throwing his signature pitch at speeds in excess of 80 mph, he flummoxed hitters with multiple variations of it, visibly improving at the age of 37. Firing consecutive one-hitters during his best stretch of the summer, in June, Dickey set a franchise record with 32 2/3 consecutive scoreless innings, later extending that to 44 2/3 innings without an earned run. Seven times he struck out at least 10 batters in a game, including a career-high 13 in his 20th victory, on Sept. 27 -- a game that appeared to lock up the Cy Young Award for him. "This is fitting recognition for a remarkable season," general manager Sandy Alderson said in a statement. "We are very proud of R.A. and what he achieved in 2012." Any thoughts of Dickey fading down the stretch evaporated when he went 5-2 with a 2.34 ERA over his final nine starts. After the last of those outings, Dickey revealed that he had been pitching since April with a torn abdominal muscle, an injury he had surgically repaired last month. As if this story needed another chapter. In winning the game's most prestigious pitching award, Dickey became the Mets' third Cy Young Award winner and their first since Dwight Gooden in 1985. Tom Seaver won three times for the Mets, in 1969, '73 and '75. "To win the Cy Young Award at his age," Gooden said in a statement, "is more incredible than when I won at age 20."